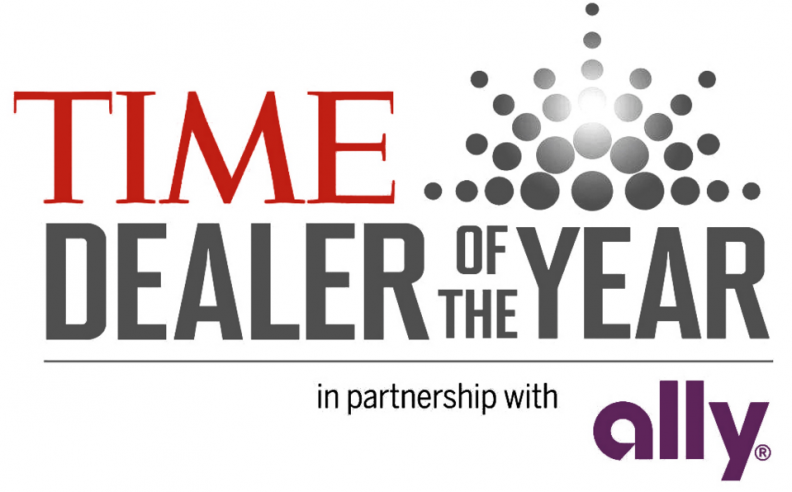 Fifty U.S. auto dealers have been nominated by automotive trade associations for the 2016 Time Dealer of the Year award. The nominees were announced by Time and Ally Financial, the sponsor. The program honors franchised new-vehicle dealers for exceptional performance in their dealerships and distinguished community service. A panel of faculty members from the Tauber Institute for Global Operations at the University of Michigan selects four finalists and then the award winner. The award is presented by Time in partnership with Ally Financial and in cooperation with the National Automobile Dealers Association. The 2016 award winner will be announced at the NADA Convention in Las Vegas on April 1. Bill Abbott of Bill Abbott Inc. in Monticello, Ill.
Currie Andrews of Andrews Cadillac Co. in Brentwood, Tenn.
William Aschenbach of King Buick-GMC in Gaithersburg, Md. Robert Basil Sr. of Robert Basil Buick-GMC-Cadillac in Orchard Park, N.Y.
Jeb Blackburn of Blackburn Nissan in Vicksburg, Miss. Henry Brown of Henry Brown Buick-GMC in Gilbert, Ariz.
Sara Carter of Carter Subaru in Shoreline, Wash.
Adam Connolly of Herb Connolly Chevrolet in Framingham, Mass. Larry Craig of Craig and Landreth Chrysler-Jeep-Dodge-Ram in Crestwood, Ky.
James Crowley of North County Cadillac-Buick-GMC in Escondido, Calif.
Julie Dunning of Dunning Toyota Ann Arbor in Ann Arbor, Mich.
Dennis Ellmer of Priority Toyota Chesapeake in Chesapeake, Va.
Steve Everett of Langdale Ford Co. in Valdosta, Ga.
Pete Greiner of Greiner Ford-Lincoln in Casper, Wyo. Tom Grossman of Suburban Chevrolet in Eden Prairie, Minn.
Hoyt Harbin of Harbin Motor Co. Inc. in Scottsboro, Ala.
Fred Hertrich III of Frederick Ford in Seaford, Del. Stephen Horn of Chevyland in Shreveport, La. Marshall Jespersen of Dover Auto World in Dover, Mass. Bill Kindle of Kindle Ford-Lincoln-Chrysler-Jeep-Dodge-Ram in Cape May Court House, N.J.
Scott LaRiche of Lou LaRiche Chevrolet in Plymouth, Mich.
Damian Mills of Stateline Chrysler-Jeep-Dodge-Ram in Fort Mill, S.C.
William Musgrave of Subaru South Boulevard in Charlotte, N.C.
Billie Nimnicht III of Nimnicht Chevrolet in Jacksonville, Fla.
Thomas Norris of Toyota of Easley in Easley, S.C.
Bob Penkhus of Bob Penkhus Volvo-Mazda-Volkswagen in Colorado Springs, Colo.
Kevin Reilly of Alexandria Hyundai in Alexandria, Va.
Frederick Rentschler of Rentschler Chrysler-Jeep-Dodge-Ram in Slatington, Pa.
Jeff Robberson of Robberson Ford Sales Inc. in Bend, Ore.
Brett Russell of Russell Chevrolet Co. in North Little Rock, Ark. Robert Rydell of Nissan of Grand Forks in Grand Forks, N.D.
Andrew Schlesinger of Andrew Toyota-Scion in Glendale, Wis.
Dennis Sheets of Sheets Chrysler-Jeep-Dodge-Ram in Beckley, W.Va.
Brad Shull of Shawnee Mission Ford in Shawnee, Kan.
Gregg Smith of Gregg Smith Ford-Lincoln Inc. in Clinton, Mo. Joseph Stanco of Rallye Motors in Roslyn, N.Y.
John Symes of Toyota Pasadena in Pasadena, Calif.
Craig Tilleman of Tilleman Motor Co. in West Havre, Mont. Kitty Van Bortel of Van Bortel Subaru in Victor, N.Y.
Jenny Wegner of Wegner Auto Co. in Pierre, S.D. Gregg Young of Gregg Young Chevrolet Inc. in Omaha, Neb.